The RGB Color Profile determines the ratio of the mixture of Red, Green and Blue with which individual colors will be represented for example on a screen. Therefore you sometimes might also hear the term „Monitor Profile“ in this context. 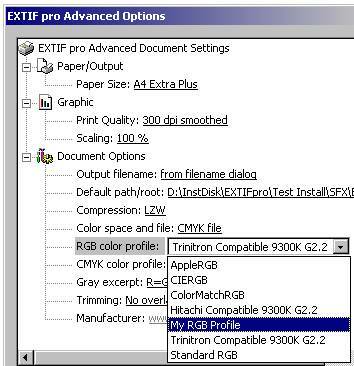 EXTIF pro by default provides the Standard RGB color profile „sRGB“ – in case you furthermore wish to use other or own color profiles, then please just copy the corresponding *.icc or *.icm files to subdirectory „User RGB Profiles“ of installation folder „EXTIF pro“ and open the Property Pages again.